Home » Posts Tagged "wan failover"
As a revision to my earlier post on the matter, here’s a better constructed way to achieve the same effect with a little more accuracy. First we use “track” to create 2 track entries to do route tracking. The first defines a “reachability” track which will be used to monitor for and perform actions on the failure of the primary route. This also delays the actions it performs on failure and restore by 20 and 60 seconds respectively to negate the effect of temporary blips. The second is a stub which allows us to take the secondary route up or down. Next we add the routes. There’s 2 default gateways added, each associated with the track entries. 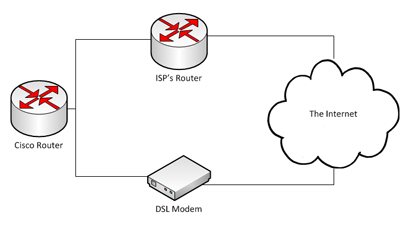 There is also a route to ensure that all traffic to the “ISP’s Router” is sent out of the fa0/0 interface. This is for monitoring. action 1.1 mail server "99.99.99.99" to "you@mail.com" from "monitor@router.local" subject "IP SLA 123 Timeout" body "Timeout on the primary line"
action 1.1 mail server "99.99.99.99" to "you@mail.com" from "monitor@router.local" subject "IP SLA 123 Restored" body "Primary line restored"
That’s largely it. It contrasts with my earlier post in such that it ignores the effect of temporary blips in the line and also sends e-mail notifications.